There’s all sorts of information to take into consideration when it comes to choosing the date and the venue to host your wedding. Two things that always come up are: Special dates in the relationship and special places in the relationship. There are other things like affordability and guest cap that help narrow down the choices but from the beginning, date and location are going to help guide the rest of your decisions. First things first: How do you imagine your wedding to be. If you had an unlimited budget and no one around you to tell you that something isn’t possible. I can attest to the fact that ANYTHING is possible… with enough research. Wedding planners and designers make a living out of having that research in their pocket already – we find a way. So, without looking at magazines or websites or talking to your family or friends, sit with your spouse and create a vision of what you would like your wedding to feel like (not look like, but feel like). I have met a lot of grooms whose opinion of it is, “Just give me the address and what time I need to be there and that’s all the input I want to give.” Other grooms are much more involved and want to participate in every facet of the planning. This is a ‘do together’ exercise that needs to be completed so you have a clear understanding of where you want to go; what you want the result to feel like. 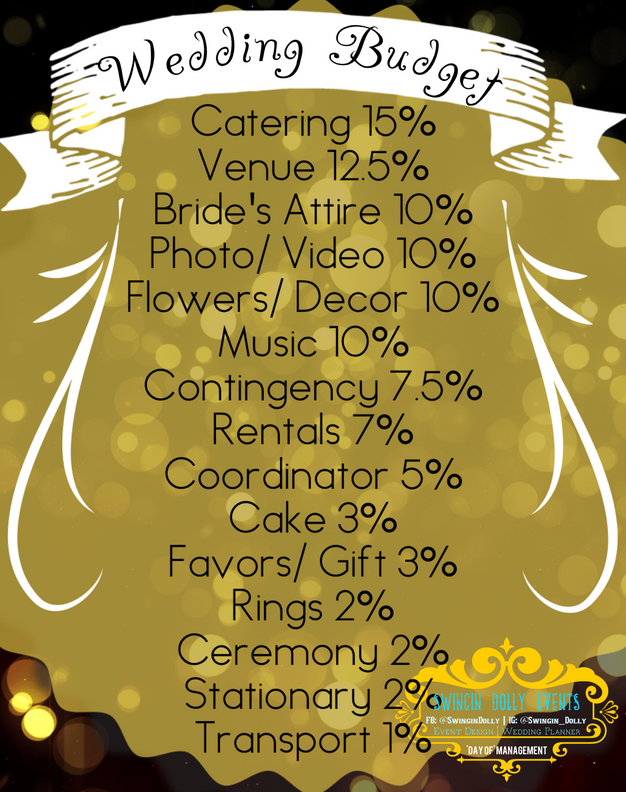 20.5% = $1,450 for the venue & ceremony locations – figure about $100 for the officiant – then 6% for renting tables, chairs, etc. 5% = $500 for the ‘Day of’ Wedding Planner. A side note here: mostly all venues require a planner of some kind for the day of the wedding in case there are issues. They won’t use a family member or a guest at the wedding. Once the ideal is specified, it’s time to get to work. If your ideal is a warm sunny day on the beach, then the date that you pick is probably going to land somewhere between May and September. If your ideal is a ballroom at a hotel, then the dates are much more open. Now to look at it from another point of view. What if your ideal is more connected to a past event – say the day you got engaged – and you want to be married on that date no matter what, then your venue selection is going to need to be more broad to make sure you have choices if one or several venues are booked for that date already. I know what you’re thinking. Is there any way to get both?? Of course, there is! We call it, “The contingency plan.” You’re going to have several of these before the planning is complete. Let’s take the first scenario to break it down. The ideal in the first scenario: Warm, summery, beach wedding. Everything starts with research. You’re going to create a list of venues and vendors that offer beach weddings. Most high-end hotels and places that specialize in weddings will have pricing and additional information readily available for consideration. When creating this list, Swingin’ Dolly has already a list of venues that have good reputations and have been tried out (to make sure they are worthy of the business), but when first creating the list, we started with map of the area we were looking to hold a wedding. Go onto maps.google.com and just list every place that cites that you can have a beach wedding with them. Every one of them. You’ll get to the exclusion part in a bit. In California, there are miles and miles of coastline; making that list would take forever if you did the whole coast. Limit your list to the area that you are going to want to go to. If you live in San Diego, it’s unlikely (though not unheard of) that you would have a beach wedding in San Francisco. Now, it’s time to cross venues off the list before even setting foot in them. Have copies of your ideal, your budget, and a rough number of guest you would expect. This number will fluctuate extremely but for right now, a general idea of how many guests will attend is going to be fine. Cross off any venues that can’t accommodate the number of guests you estimate. Good price or bad price, if they can only accommodate 50 people and you’re thinking closer to 150, this isn’t a good fit for you. You want to also cross out any venue that has things you don’t want or leaves things out that you think you need. For example, there are venues that don’t allow hard alcohol or open flames. If you feel you need both vodka and torches, then this isn’t the venue for you. Most venues will list their offered amenities right on their websites. There are some venues that don’t allow children. There are some venues that require an open bar. Go through your shrinking list and take off any venue that doesn’t seem to fit your needs. Next comes price of the venues that already had pricing available. You’re going to be doing a lot of research, let’s keep the work part down to a minimum so that you’re not spending time researching venues that are going to be eliminated at the very beginning. All-inclusive venues always feel like they are more expensive because the cost they post seem high. Things to keep in mind is that they are including the price of the venue/ food/ linen/ security/ lighting/ permits/ furniture/ servers & bartenders, etc. When you plan the wedding by yourself and you do it a la carte, you will see that the prices are competitive most of the time. When looking at your budget, you’re going to spend between 9% and 10% of your budget on your venue & ceremony locations. Using $10,000 as our example budget, that means you can spend a maximum of $1,000 on your venue. That can make things more complicated, but it’s not impossible. It’s all about RESEARCH! So, as you’re going through your list, if you come across a venue that is say, $1,200 but they include the wedding cake, then you are within budget. If you find a venue that is $4,100 but they include the catering (except the bar) and the cake, then you are within budget. It leaves you $900 for booze. If the venue is $2000 and doesn’t include anything, then you may need to cut that venue from the list. You get the idea? Now, you are still not calling or meeting any venue at this time, you are just working on the ones where the data was readily available. If you have any questions, please feel free to contact me any time. NOTE: Continuously bringing you the most current and accurate information that we can, we have updated this article 07/20/17 to reflect what we believe to be more accurate percentages for your budget. We added also an infopic to reflect the most current information.